Lycopene is currently the most powerful antioxidant which has been measured in food (2) and is thought to play a role in preventing cancer, heart disease, and macular degeneration (3,4,5,6,7,8). How large a protective role lycopene plays is a controversial issue which is still under scientific study. Lycopene is a carotenoid that gives many fruits and vegetables their red color, eating lycopene in excess amounts can cause the skin and liver to have a yellow color. Unlike other carotenes, lycopene does not get converted into vitamin A. 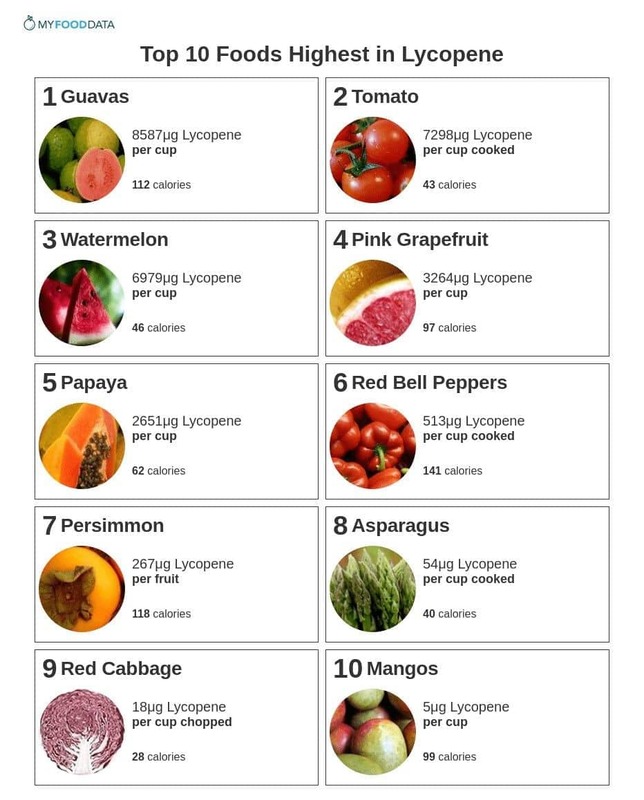 There are no known symptoms of a lycopene deficiency, and no daily value (DV) for lycopene. Mamey Sapote provides 384μg per cup. Consuming excess amounts of lycopene can lead to skin discolorations known as lycopenodermia. This condition is considered harmless and will go away on its own when lycopene is no longer consumed. Upper limits for intake of lycopene have not been established, and consuming high doses of lycopene should be approached with caution and doctor supervision. Mascio PD, Kaiser S, Sies H. Lycopene as the most efficient biological carotenoid singlet oxygen quencher. Biochemistry and Biophysics Volume 274, Issue 2, 1 November 1989, Pages 532-538. Sies H, Stahl W. Lycopene: antioxidant and biological effects and its bioavailability in the human. Proc Soc Exp Biol Med. 1998;218:121-124. Sesso HD, Liu S, Gaziano JM, et al. Dietary lycopene, tomato-based food products and cardiovascular disease in women. J Nutr. 2003;133:2336-2341. Mares-Perlman JA, Brady WE, Klein R, et al. Serum antioxidants and age-related macular degeneration in a population-based case-control study. Arch Ophthalmol. 1995;113:1518-1523.